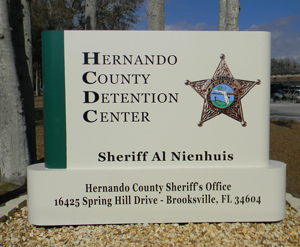 The Hernando County Detention Center is the central booking and intake location for all law enforcement agencies operating in Hernando County. The care, custody and control of individuals arrested in Hernando County by the Sheriff's Office and various state and local police agencies is the responsibility of the Detention Center. Confined in the Hernando County Detention Center are those individuals who have been arrested and held without bond, been unable to post bail set by the courts, are being transferred from other states or counties while awaiting trial in Hernando County, or those found guilty and sentenced to serve less than one year in county jail. The Sheriff operates the Hernando County Detention Center which has an authorized capacity of 744 inmates. The facility houses males, females and juveniles between the ages of 14 and 17 who have been adjudicated for treatment as adults charged or sentenced on misdemeanor and felony crimes. Respect- We recognize that all members, regardless of rank, are important to our mission and deserve respect. We embrace cultural diversity and understand that the service we provide is greatly improved through the efforts of a diverse staff. Ingenuity- We recognize the intelligence and life experience of our diverse workforce and solicit that experience toward meeting the challenges that we face. Teamwork- We understand that individually we are strong and that combining our strengths and working together is the best way to accomplish our mission. Accountability- We will conduct ourselves in a manner above reproach; we realize, on occasion, we may fall short and expect to be held accountable for our actions in a fair and consistent manner. Education- We recognize that criminal justice is a field of evolving complexity that requires highly educated, 'Big Picture Thinkers,' to meet the challenges of tomorrow and lead the organization into the future. Pride- We are proud of the organization which we have built, and will continue to strive for excellence and be the example for others to follow. Integrity- We will earn trust by utilizing the utmost standard of ethics, which includes honesty without deception and to make morally right decisions. We will incorporate honor, integrity, and fairness in all of our actions. We seek to be a source of credit and distinction in our service to the community by maintaining a safe and humane environment for those in our charge. The Hernando County Sheriff's Office, Detention Division envisions a professional correctional staff that are dedicated to service and partnership with the community, and who ensure fiscal responsibility while being proactive in training, education, and recruitment. There are no public notices currently. © 2018 Hernando County Sheriff. All rights reserved.